A Syrian regime MiG has bombed the Crac des Chevaliers, damaging a tower of one of the best-preserved crusader castles in existence. Several videos posted online Saturday showed at least one airstrike on Friday against the castle in central Homs province, where fighting is raging between government troops and rebel forces. 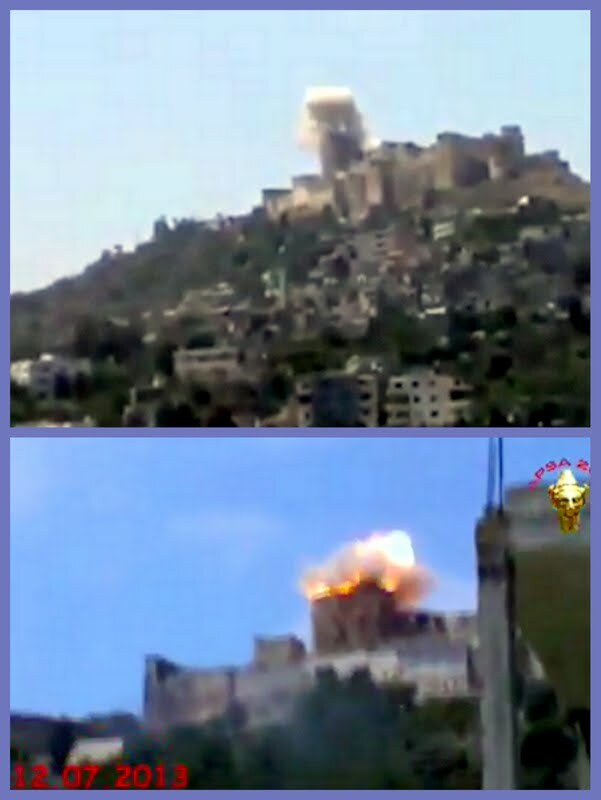 The footage shows a huge blast, as a tower of the fortress, which is built on a hill, takes a direct hit, sending a plume of smoke and dust into the sky. 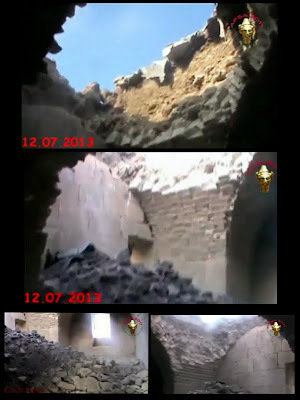 A separate video filmed inside the castle shows some of the damage caused by the airstrike, including a gaping hole in the ceiling and a mound of debris and heavy stones under the open roof. Dominating their surrounding landscapes, the two castles of Crac des Chevaliers and Qal'at Salah Ed-Din are outstanding examples of fortified architecture relating to the Crusader period. UNESCO says their quality of construction and the survival of historical stratigraphy demonstrate the interchange of defensive technology through features of each phase of military occupation. Strategically placed at the entrance to the Homs Gap, the Crac des Chevaliers is about an hour’s drive from Homs city. “The very reason why the castle was built, its vantage point, is the reason why it is again under attack,” Chris Doyle, director of the Council for Arab-British Understanding, tells The Daily Telegraph. The fort was placed on the UNESCO world heritage list in 2006, and is one of six designated sites in Syria that as recently as 2010 helped attract 8.5 million visitors. Among Syria’s other UNESCO-listed world heritage sites, the Great Mosque of Aleppo and the ancient Roman ruins of Palmyra have also been damaged by the 28-month-old conflict. 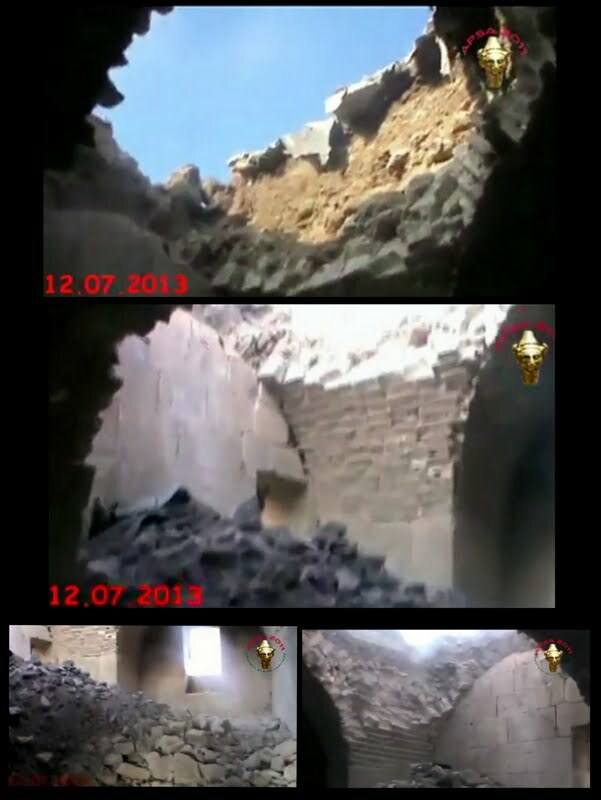 One report from Palmyra said soldiers were removing the stones from the ruins to build defenses. Fighting has also destroyed the ancient souk of Aleppo and the 5,000-year-old Temple of the Storm God beneath the city’s ramparts. Rebel-held areas of Homs city have been under intense assault from government forces since June 28, and UN officials said in a joint statement on Friday that they are "extremely alarmed by the escalating violence" in Homs and Aleppo.